The Akwariom Kontrol can be USB bus powered , or via the 230V input. 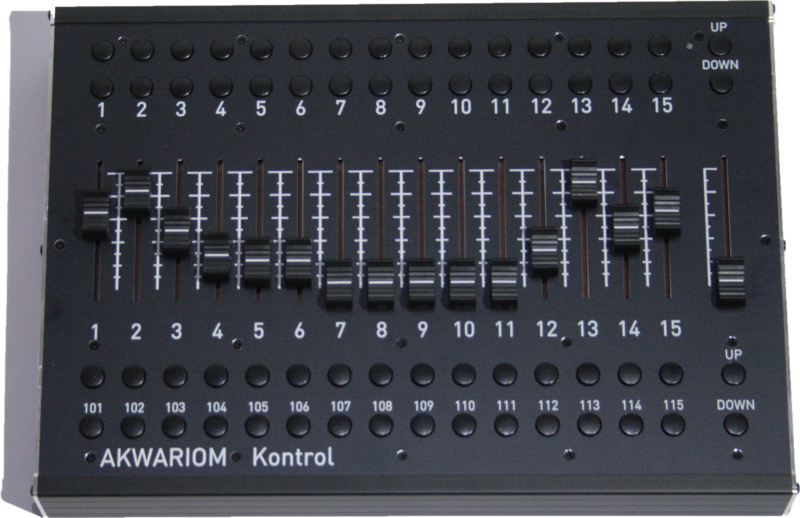 Out of the box, it outputs MIDI on channel 1, but can be assigned to any of the first 4 channels using two switches on the back panel. The MIDI merge works on the 16 channels. 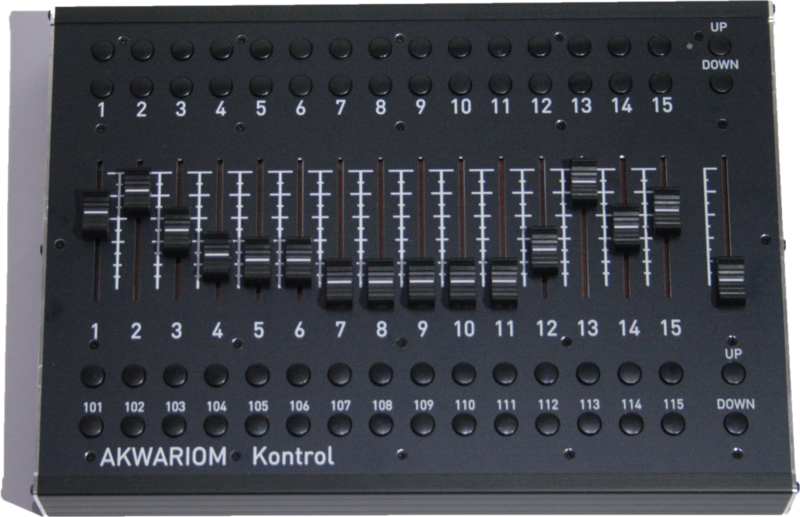 The Kontrol sends DMX corresponding to the buttons and fader states (faders from 0 to 255, buttons : 0 when released, 255 when pressed). The Kontrol sends MIDI signals out the DIN MIDI OUT and the USB simultaneously. Pressing a button sends a “NOTE ON” message, releasing it sends a “NOTE OFF” message. Faders send a “NOTE ON” message with the velocity corresponding to the fader position (mode to be used to control MA Lighting equipments). The DMX and MIDI channels/controller/note numbers corresponding to the faders and buttons are fixed, to allow for an easy configuration, as every software allows for flexible controllers mapping. 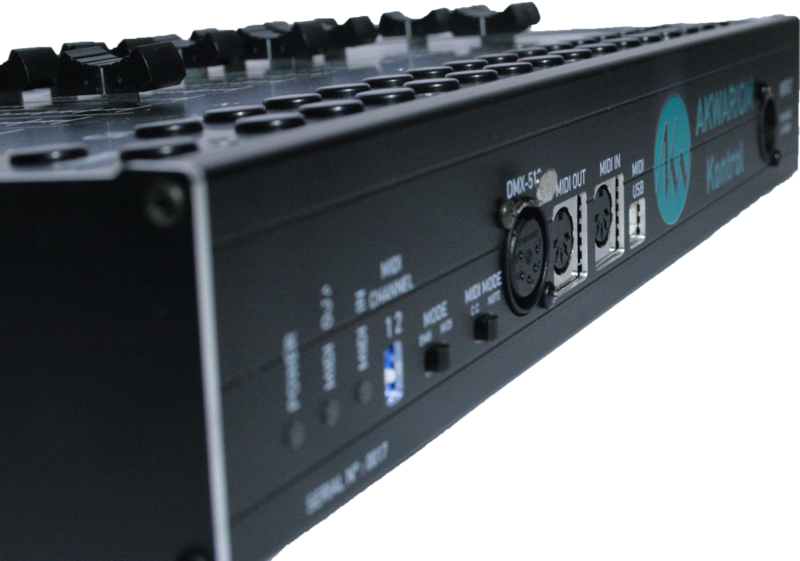 The included MIDI-USB interface does not need any driver on win XP, win 7, win 8 or Mac OS X. We purposely created this interface according to the Grand-MA 2 layout, but you can of course use it in a completely different way as every button and fader can be mapped to anything. It has been designed for intense use, with quality components (buttons & faders), a universal power supply (90 to 264Vac, 47 to 440Hz) on a Powercon True One “Neutrik” connector, a solid aluminium box and professional class connectors.